Everybody seems obsessed with lowering cholesterol levels. Doctors, the media and even your friend Helen from church. But no one ever talks about what you can do to raise your cholesterol numbers. Yes, I said RAISE them. Because the truth is, despite all the hype, your cholesterol isn’t just one single number. While you might be legitimately concerned about keeping your LDL, or so called “bad” cholesterol, in check you should also focus on raising your HDL, or “good,” cholesterol. Because even if overall cholesterol numbers go down, if your HDL is low too, it means you could be doing better. In fact, higher HDL levels naturally help keep LDL levels in check. So how do you raise them without raising your LDL numbers, too? You don’t have to swear off of all desserts to maintain healthy cholesterol levels. The antioxidants in dark chocolate are linked to higher HDL numbers. Aim for 2.5 ounces per day for the best results. Thanks to their high fiber content, these delicious cool weather fruits do double duty, raising your HDL levels and lowering LDL at the same time. Pears are a great choice if you’re looking to satisfy your sweet tooth without adding a lot of extra sugar to your diet. 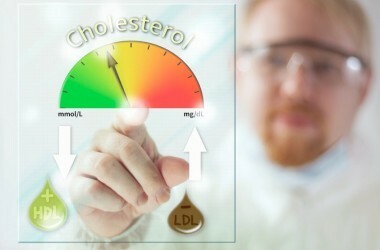 Given that cholesterol is fat, you’re forgiven if you thought you should be avoiding fat to keep your numbers in line. But the truth is, good fats, such as extra-virgin olive oil and avocado oil, can help raise HDL good cholesterol. Experts believe the antioxidant polyphenols in the oil are responsible for the bump in HDL. The fiber in legumes—think kidney beans, lentils, black eyed peas and the like—boost HDL levels. For added heart benefits start with dried beans and soak them yourself to double the amount of heart-healthy folate. Fatty fish—such as herring, salmon, mackerel and sardines—are great for your heart health. They’re brimming with the omega-3s EPA and DHA. These fatty acids don’t just help lower LDL levels, but boost HDL good cholesterol at the same time. Herring, for example, is bursting at the seams with 1500+ mg of omega-3s in every serving. If fish isn’t your favorite food, or fitting several servings in a week doesn’t always work out, fish oil supplements are a good choice too. On your next trip to the grocery store, think “purple.” In the produce aisle be on the lookout for purple hued foods such as eggplant, red cabbage, purple grapes and blueberries. Anthocyanins, which give these fruits and veggies their purplish hue, are associated with a 13 to 19 percent rise in HDL numbers. Yet purple foods make up only about three percent of the average American’s diet. Don’t be average. Pick purple. Many folks reject coconut oil because of its fat content. For years now, the message has been saturated fats are terrible for our health. But research has found coconut oil actually has heart health benefits. In fact, studies have found it can help raise HDL while lowering LDL. Aim to add two tablespoons of coconut oil to your daily diet. Maintaining healthy LDL cholesterol levels is great. But it’s important that your HDL good cholesterol numbers are high enough too. Plan your menus wisely, and you can move all your important numbers into the healthy zone.